The tsunami struck your hometown. Can you talk about how you felt when you saw that? When on TV I saw the wave hit the town centre of Miyako, where I was born, it was incredible. As children, we were taught that there’s a possibility of tsunamis, and there were often tsunami warnings. When I was a child, we were brought to a place and shown how high a previous tsunami went. But we were also taught that the sea wall built there is so strong. To see the water go right over it was incredible. Was anyone you know affected? There’s a woman there now—I went to kindergarten with her. She lost her house. I went to visit the family. There were shocked, but happy no one in the family was killed. They’re grateful. But they didn’t think this would ever happen in their lifetime. It had a deep impact on them. The phrase “tsunami tendenko” was often invoked during the crisis. What does it mean? It basically means, if a tsunami comes, run uphill and don’t think about others. It’s wisdom from the old days. As a Christian leader, how do you interpret that? First you have to save your life. It’s like the oxygen mask on a plane—if you save yourself you may be able to help others. You lived for many years in Ghana, which suffers its own crises. Did you notice any similarities between the two countries when disaster strikes? After the tsunami struck, the way people helped each other—we thought that spirit was gone. In Japan you don’t always know your neighbour. But there was a real communal spirit. I saw the same thing in Ghana—the spirit of helping each other and sharing. There would be a drought every year, but even when people were rushing for water, they didn’t want anyone to die. 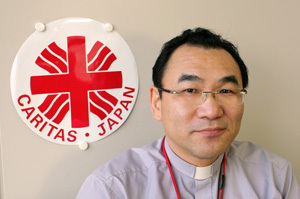 When the tsunami hit, what were your first thoughts in your role as the president of Caritas Japan? At first I thought of course we need money, but we also need to take care of people’s hearts. How are the people in the tsunami-affected region doing? Even before the tsunami, the area was tired and aging. Young people were leaving. It was already hard to think of a bright future, and then the tsunami happened. Caritas Japan and the Catholic Church in Japan have been working to help suicidal people for years, well before the tsunami. Do you think this latest crisis will impact the number of suicides in Japan, which is already very high? Before the tsunami, we thought suicide happened because the bonds of community were weakened and people felt alone and isolated. They lose hope when facing problems like unemployment or debt, and kill themselves. I think the number of suicides may increase because so many people lost their families or lost hope. That’s why Caritas volunteers are going out and listening to the survivors. Caritas has attracted thousands of volunteers who are providing psychosocial support to survivors, as well as cleaning up debris and distributing relief items. You’ve attracted many non-Christian volunteers. Why do you think that is? At Caritas, we say we’re Christian, but of course we don’t force people to be Christian. And our political position is neutral. Volunteers like the atmosphere at our centres. Caritas Japan is helping small businesses rebuild. Why is that one focus of your relief efforts? Up until the tsunami we didn’t know there were so many small companies in the area, making parts for big corporations. In Japan, on a plastic bottle of Coke, the cap used to be coloured. After the tsunami, is was just white., because the place that manufactured the coloured caps was hit by the tsunami. There are lots of small business owners who were badly affected by the tsunami. What have you heard from Caritas groups in other countries? I received so many emails and calls from Caritas members worldwide. I felt we were really in solidarity with others, we weren’t left alone. In a difficult time, there were people ready to help us. Have certain scripture verses or songs come to mind in the months since the tsunami? God must have some plan, but it’s very hard to say this to people in grief. I believe that out of this disaster God has formed his own plan. What motivates Caritas Japan in this work? We want to walk along with the people. The needs of the people my change over time. We want to listen to their needs–not just material but spiritual—and their cry. We’re trying to accompany the victims. Looking at the devastation, it seems almost an impossible task to rebuild. Yet so many people all over Japan are coming to help clean up the coastal cities and start over. There’s a feeling that “we can do this.” Where is that strength coming from?